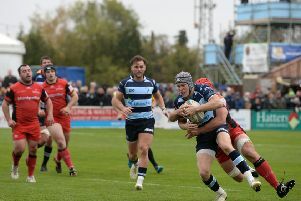 The full schedule of Championship fixtures was confirmed today with the Blues first home game of the season seeing Kevin Maggs bringing his Moseley team to Goldington Road on the weekend of 11th/12th/13th September before Bedford see out September with two trips on the road to London Scottish and London Welsh. Bedford start October with a visit from Nottingham - who signed three Blues players in the summer - before setting sail for Jersey the following weekend. Rotherham will enjoy Bedford’s hospitality in round seven before the Blues make the trip to newly promoted Ealing, while there will then be a break on October 31 for the Rugby World Cup Final. November opens with the Blues facing Yorkshire Carnegie at Goldington Road before the first two rounds of the British & Irish Cup take place and the month ends with a long trip down to the Mennaye Field to face Cornish Pirates. Doncaster Knights are the visitors on the opening weekend of December ahead of two British & Irish Cup encounters, as the month ends with a festive clash at Billesley Common against Moseley. Bedford travel to Lady Bay to face Nottingham in February ahead of the Valentine’s weekend visit of Jersey, while a free weekend follows before the month is rounded off with a trip to Clifton Lane to face Rotherham. Speaking about the fixtures, Blues Director of Rugby Mike Rayer said: “Everybody is always excited when the fixtures comes out as it allows us and the fans the chance to start planning the year ahead.